This was actually onigiri from the Family Mart in KLIA2. I think it costed about RM5. It was so-so, I had to take a second bite before I hit the salmon flakes. I do wanna try the matcha ice-cream from Family Mart, haven’t got the chance to yet. This was my first meal in Bangkok, right after we landed, boat noodles! It was at some stall/restaurant near a river (drain), I’m not too sure. I’ve always wanted to try boat noodles when I’m in Malaysia, but never really got the chance to. I tried a pork one, a beef one and a tomyam one. It was a pretty good snack. And later we tried that dessert thing which is green at the bottom and white on the top. Those were good, and pretty addictive. One bowl of boat noodles cost 12 baht, and one of those dessert thing costs 5 baht. I tried this xtreme choc mint ice-cream from the 7-11 and it was so good! Almost in all indoor food court, the Thais use a food court card system. You load a card with some money at a counter, and purchase your meal. You can redeem the balance from the card when you’re done. I tried the mango sticky rice (70 baht) and basic pad thai (30 baht) at the food court in Terminal 21. It was amazing! Sad thing was I only ate mango sticky rice once when I went to Thailand. This was a Thai Tea flavoured ice-cream I got from an ice-cream stall at Ayutthaya train station. The stall was near the washroom. It was pretty yummy, I wish I could’ve tried all the flavours the man sold. One of the things I like to do in a new country is try out the local beer. I’m not a fan of beers but I just like to try them. I tried Singha and Chang when I was in Thailand, I think it was alright, not a beer critique. These were the Thai instant cup noodles that I tried. This is called Betagen, it’s a cultured milk drink, something like Yakult or Vitagen. Betagen spray is also a topical skin treatment for dogs, so don’t get that mixed up. Betagen is one of the items that all of us continuously get whenever we hit any 7-11. I love that they sell them in bottles, I’m not sure how many servings one bottle is for, but I’m glad I could drink till I’m satisfied. In Malaysia, Yakults and Vitagens come in really small bottles, the kind you can even finish in one gulp. This is a coconut flavoured yogurt which according to Dave can only be found in Thailand. It’s super good. I wish they have them in Malaysia and I would totally stock up on it. This was some noodle we got from a roadside stall in Pak Chong which costed 40 baht. I like how the Thais are generous with the meat, or at least it is proportionate. This was coconut water from 7-11. Haha. This was during the third day when somehow I still couldn’t find fresh coconut water to drink! This is another random noodle from a roadside stall in which the noodles wasn’t well cooked so it was kinda tough. But the owner of the stall was really happy that day I think cause suddenly she was making money from 19 people! This was corn I got outside the winery! One of the mini highlights of my trip was eating corn on the bike ride, I was Xiao Zhu’s pillion rider. It was just so satisfying to be out in the open, wind hitting my face and munching on my corn. When I was done, I just threw the cob by the roadside, cause it’s organic and it’ll decompose. This was my first fresh coconut drink! I got it from some road side stall when they were filling gas for the motorbikes. And I got it cause it was 30 baht. Whenever I see fresh coconut that cost 50 baht and above, I won’t buy it. Dave recommended this yogurt as well but I didn’t fancy it. Bugs for the tummy! I didn’t try this, hopefully next time. This was in Chinatown. This was a glass noodle dish that Dave loves. I asked him what it’s called several times but I keep forgetting. I only love the glass noodle part, I didn’t quite like the quite raw vegetable, especially the cabbages. This was Thai Bubble Milk Tea from this shop called CoCo. It was good! Only wished I had it more than once when I was in Thailand. This was my second and last fresh coconut drink from a stall called Punjung in Mae Klong Railway Market. Next up is a series of food Jashon, Guat Ling and I had at Amphawa Floating Market! This was pork satay, which is delicious, especially when it’s still warm. This was some glass noodle dish which I super love. Sorry I just didn’t remember the names to the dishes. This was fried mussels, which is supposedly something like the Taiwanese fried oysters, but it was just meh. There was just a lot of flour and not many mussels. I could count them with one hand. Pad Thai from Amphawa Floating Market. I was wondering, is there any Pad Thai in Thailand that doesn’t taste good? Grilled squid! Also tastes better when it’s warm, I loved pairing this with the glass noodle dish. 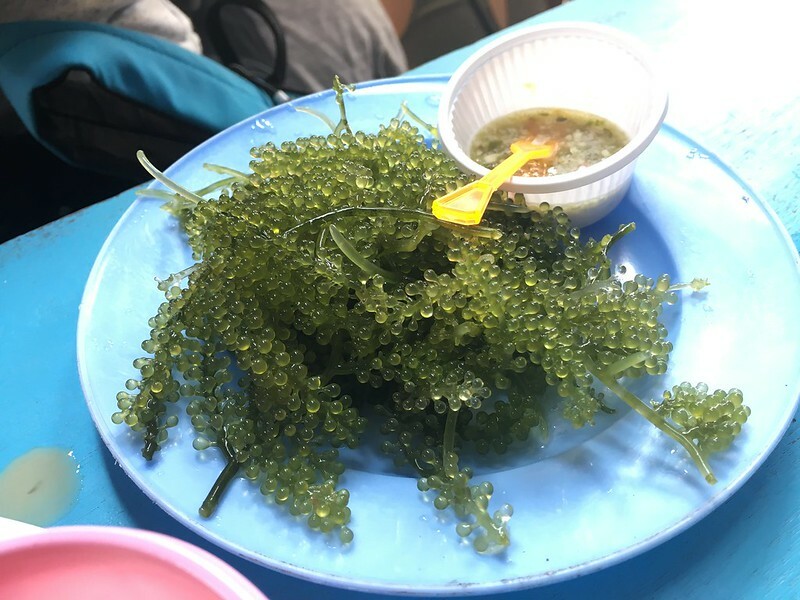 This green caviar was not impressive at all. And it was 100 baht. This salad dish with some seafood’s (I forgot what was the name of the seafood) egg was awesome! There was just this unique taste to it that made it pretty irresistible. Coconut ice-cream that cost 40 baht! Something like this in Malaysia, maybe at Sangkaya would cost more than RM 10. Wth. It was super good too! That’s pretty much the food I tried in Thailand. We had many meals in 7-11. The 7-11 in Thailand is impressive, you can find it everywhere except maybe the airport. And the instant and frozen food they sold were delicious and reasonably priced. God I wish the 7-11 in Malaysia was like that. They even sell frozen burgers which tasted good. These were the last 2 items I had before boarding the flight back to KL. Pork Pepper Lunch, and also Crunchy Choco Dip from McDonalds. The crunchy choco dip was so good. I hope it comes to Malaysia some day. And that’s the last of Thailand 1.0, hope you enjoyed reading, or at least going through the photos. Haha.